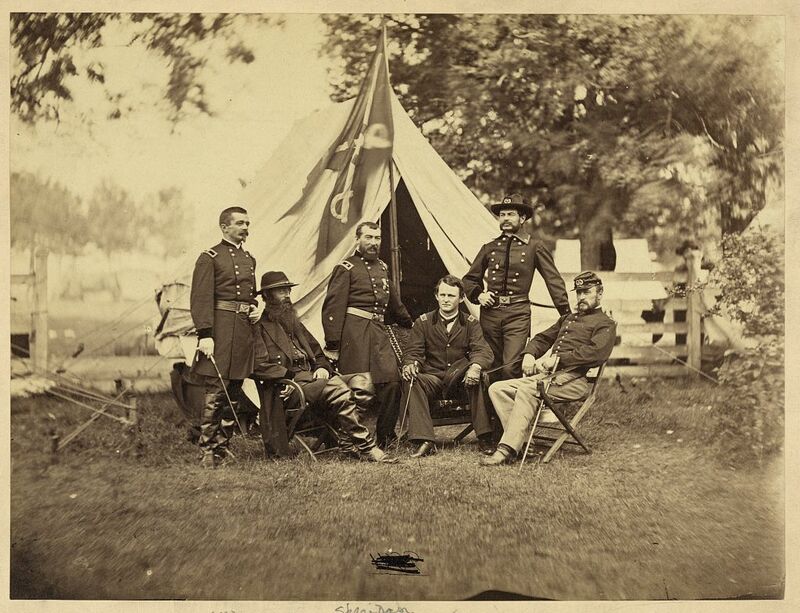 Maj. Gen. Phillip Sheridan, standing in the center underneath the guidon, surrounded by his subordinates. To Sheridan’s left is Wesley Merritt and Alfred Torbert, whose men the Confederates around Old Cold Harbor on May 31. On May 30, 1864, Philip Sheridan’s Union cavalry tangled with Confederate horsemen in the vicinity of Old Church northeast of Richmond. After the Battle of Haw’s Shop, Sheridan had been sent to Old Church to secure the roads leading to the Union supply depot at White House Landing and screen the arrival of William Smith’s XVIII Corps then in route to the Army of the Potomac positioned along Totopotomoy Creek. Sheridan’s presence alarmed Robert E. Lee, who sent gray cavalryman under Matthew Butler and Martin Gary to see what the Federals were up to. The mounted forces clashed along the banks of Matadequin Creek and the Yankees eventually pushed the Rebels back toward a crossroads known as Old Cold Harbor. Fitzhugh Lee’s brigades under Lunsford Lomax and Williams Wickham arrived around noon after the fighting had ended to relieve Butler and Gary. The next day, Sheridan decided to renew the attack on Lee’s troopers. Sheridan’s planned offensive called for Col. Thomas Devin’s brigade to advance along a by road and turn the Rebel right flank. In concert with Devin’s advance, Brig. Gen. Wesley Merritt’s brigade, supported by Brig. Gen. George Custer’s command advanced directly on Lomax’s brigade on the Cold Harbor Road. Moving along Black Creek Church Road, the 9th New York and 17th Pennsylvania ran into stiff resistance from Wickham and eventually ground to a halt. On Devin’s right, Merritt had steadily pushed Lomax’s pickets back to the main line, which was “posted behind breastworks of logs, rails and earth.” Merritt dismounted and deployed three regiments to attack Lomax. The 5th U.S. Cavalry held the right, the 1st New York Dragoons the center and the 6th Pennsylvania Cavalry the left of the Union line. As Merritt advanced, Confederate infantry from Col. Thomas Clingman’s brigade arrived to bolster Lomax’s position. The Confederates “poured upon us a most withering fire” recalled one of the Dragoons. “They had decidedly the advantage, and could shoot us down like turkeys in a pen.” Like Devin’s attack, Merritt had been stymied in front of Lomax. Reinforced now by Custer’s brigade of Michigan regiments, Merritt’s superior, Alfred Torbert decided to turn the Confederate left. Torbert’s flanking force was led by Merritt and consisted of the 1st and 2nd U.S. Cavalry, along with the 5th Michigan. The rest of Merritt and Custer’s regiments were to keep the enemy occupied along the Cold Harbor Road. Torbert’s plan worked and Merritt’s force slowly but steadily rolled up the Confederate line. The crushing blow came when Custer sent a battalion from the 6th Michigan under Maj. Melvin Brewer in a mounted charge that struck the enemy line along the Cold Harbor Road. Under the weight of Merritt and Custer, the Rebels collapsed and ran for the rear as Sheridan took possession of Old Cold Harbor. Sheridan’s capture of the crossroads loomed large in the thinking of U.S. Grant and George G. Meade. One road led to White House Landing while another led directly to Richmond. From a strategic perspective, it had to be held. Although Sheridan quietly abandoned the position late that night, a courier from army headquarters later arrived and ordered him back to his lines. The next morning, Sheridan managed to withstand Confederate attacks long enough for Union infantry to arrive. By the afternoon of June 1, the stage had been set for the famous infantry fighting at Cold Harbor to begin. This entry was posted in Armies, Battlefields & Historic Places, Battles, Campaigns, Cavalry, Leadership--Confederate, Leadership--Federal and tagged 17th Pennsylvania, 1st New York Dragoons, 1st U.S. Cavalry, 5th Michigan Cavalry, 5th U.S. Cavalry, 6th Michigan Cavalry, 6th Pennsylvania Cavalry, 6th U.S. Cavalry, 9th New York, Alfred Torbert, Black Creek Church Road, George A. Custer, Haw's Shop, Lunsford Lomax, Major Melvin Brewer, Martin Gary, Matadequin Creek, Matthew C. Butler, Old Church, Philip Sheridan, Thomas Clingman, Thomas Devin, Totopotomoy Creek, Wesley Merritt, White House Landing, William Smith, Williams Wickham, XVIII Corps. Bookmark the permalink.